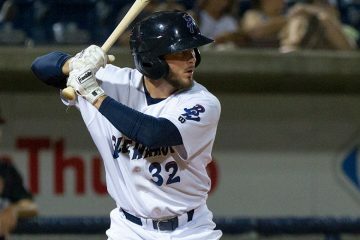 When the 2017 season began for Randy Ventura it was in the Atlanta Braves organization. 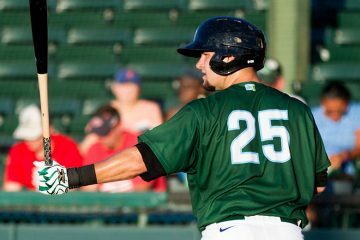 He played in the rookie level Gulf Coast League in 2016. For 2017 the Braves sent the 19-year-old (he’s now 20) to full season ball with their Low-A affiliate in Rome. The opener was postponed, so Randy Ventura and the Braves played a double header on April 7th. He went 0-2 with a walk in the first game. In the second game he would go 1-3 with a walk and a run. That began a 10-game hitting streak for Ventura where he would go 16-37 (.432) with a double and seven stolen bases. On the 19th he went 0-4, but got back in the groove quickly. Over the final ten games of the month he racked up 12 more hits in 35 at-bats. He’d also steal another six bases in that span. The teenager hit .359/.419/.397 in 22 games with three doubles, eight walks, 13 steals and 15 strikeouts. In the first week of May, Randy Ventura ran off a 7-game hitting streak. He went 10-28 (.357) without an extra-base hit and he walked twice. That came to an end on May 10th with an 0-5 effort against Hagerstown, but another hit streak started the next day. Over the next 11 games he’d hit in all of them, before going 0-4 on the 27th. The final three games of the month also featured at least one hit. May represented another month with a high average for Ventura, posting a .321/.348/.340 line. He only drew five walks in 113 plate appearances while striking out 21 times. It also came with just two doubles as his power continued to lag behind. After ending May riding a 3-game hitting streak, Randy Ventura carried that to nine games into June by going 9-26 over the first week. The switch hitter went into a slump over the next six games, going 2-27 over the second week of the month. He would hit in the next eight games, going 11-37 before ending the month hitless in the final two games. June was a step backwards for Ventura as he hit just .227/.272/.258 in 103 plate appearances. He had just one double and one triple in the month as his power failed to show up once again, and he added just five walks with 23 strikeouts. July began with a 4-game hitting streak for Randy Ventura. One of those hits was his first home run of the season – an opposite field shot that hit the first row of seats over the left field wall. The outfielder would go 0-9 over the next three games, but then ran off a hitting streak of 14 games. In that span he went 20-52 (.385) with four walks and a double. He’d finish out the month going 2-16 in the final four games. It was a rebound month for Ventura, posting a .283/.333/.326 line. The power still hadn’t shown up as he had just two extra-base hits in 100 plate appearances to go with six walks and 23 strikeouts. August began with Randy Ventura going 1-4 in each of his first two games against Augusta. Then he would find out that he was traded to the Cincinnati Reds on August 4th. He was acquired in exchange for international bonus pool cap space. 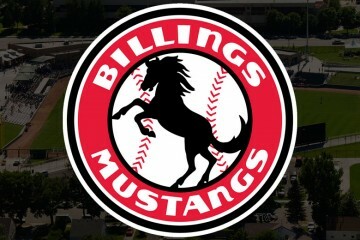 The Reds assigned him to their Low-A affiliate in Dayton where he joined the Dragons outfield. 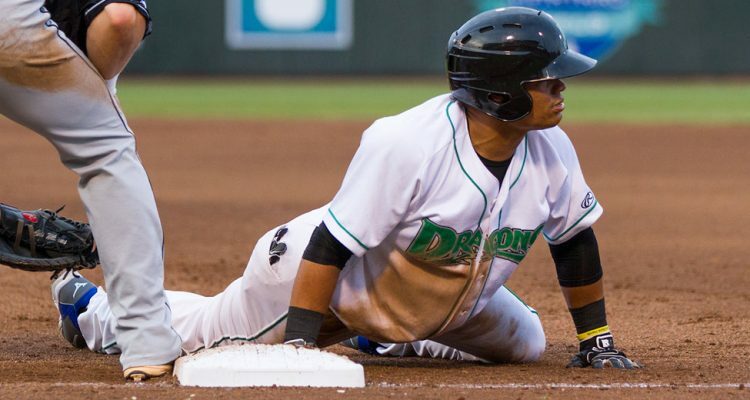 He went 3-9 in the first two games with the Dragons, including a double and a walk. But he went into a bit of a slump after that. Over the next week he would go 3-27 (.111) with three walks. Ventura would catch fire the rest of the year. In the final 17 games of the season he had hits in 16 of them, going 23-69 (.333) with six doubles, a triple, a home run and seven walks. He also stole six bases in that span. In total, over the final 28 games of the season Randy Ventua hit .274/.336/.389 with 10 extra-base hits, 11 walks and nine steals in 28 games played. For all 2017 Season Reviews and Scouting Reports – click here (these will come out during the week throughout the offseason). As a switch hitter, there are three different spray charts. The first will be a full spray chart, then followed by Ventura’s spray chart as a left handed hitter, and then by his chart as a right handed hitter. Hitting | Randy Ventura is a switch hitter, but he’s been significantly better from the left side of the plate than the right side throughout his short career. As a lefty he’s hit .303, but he’s hit just .243 as a righty over the last two seasons. His ability to bunt and beat out infield singles let’s his hit tool play up some. He could be a slightly above-average hitter for average in the future. He projects better from the left side than the right. Power | Ventura is a bit understized, and he hasn’t hit for much power in his career. There’s a little more power potential in there, though – with 10-12 home runs in the future not being out of the question. Running | He’s an above-average to plus speed guy who can use his speed well. Arm | He shows off an above-average arm that will play anywhere in the outfield. Defense | He’s capable of playing center field, but can also handle left or right field where his range really stands out. The 2018 season was an interesting one for Randy Ventura. His strikeout rate jumped up quite a bit and his walk rate dropped off from the previous two years. His power also dropped off the map. 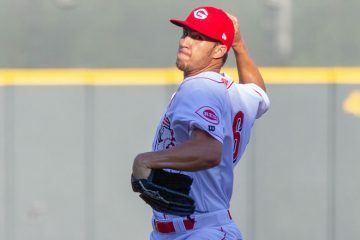 Once he joined the Reds organization – granted in only 118 plate appearances, he saw his walk rate climb, his strikeout rate drop, and his power come to life. Ventura had more extra-base hits in 26 games with Dayton than he had in 95 games with Rome. The peripheral rates that Randy Ventura had in Dayton could lead to a projectable offensive player if he can remain in center. He drew walks, had a solid strikeout rate and finally started showing a little bit of power. There’s more power in there that could come in the future, too. It’s that version of Ventura that lines up more with scouting reports than the version that played in Rome for most of the season. With the speed to steal 25+ bases in the Major Leagues, good defense with both range and a quality arm, if he can round out things with his bat, he could become a quality prospect in short order that rises up the prospect rankings. To do that he will need to find a way to get the ball off of the ground more. He’s been a ground ball machine for his career. The upside isn’t likely more than a solid regular center fielder, but there are plenty of things to like from one of the newer Reds prospect acquisitions, and plenty of room to grow. It will be interesting to see how playing time is split between our outfielders at Dayton and Daytona as we have several strong candidates for both A+ and A ball. I’d guess that Ventura starts back in Dayton, but could be the first one promoted if Trammell, Siri, or Freidl can work their way to Pensacola (as long as his performance dictates it of course) during the year. Maybe I was spoiled by the Friedl, Trammel, Siri, Beltre group that started the year in Dayton 2017, but just from my eye test I was a little disappointed with what I saw from Randy. Which by no means says he was anything but good. Maybe seeing his Rome numbers my expectations were too high and I just can’t pinpoint my concerns but I would put him on a similar plane with Beltre though they have different skill sets. I think you are correct in thinking Duke that at least one or two of these guys is going to need to be in Pensacola to clear some logjam. Probably not to start the year though. I think we see Ventura backing up all 3 OF spots in Dayton but getting solid playing time spelling the starters. Another very good defensive OF for Dayton, with all 3 guys likely getting time in CF, but I think Fairchild gets the most as the higher draft pick. If Siri misses the start of the year I hope we see Trammell in CF more than Friedl. You meant Macho Man Randy the Body Ventura…unless his middle name is Jake. I was wondering if Randy Ventura is the illegimate son of Randy Macho Man Savage and Jesse Ventura. Curious, when reading about switch hitters, we periodically see a situation like Ventura’s where he hits .303 as a lefty and .243 as a righty. When the situation L/L is he worse than .243 hitter? Is that why he switches right? Otherwise it really doesn’t make much sense to switch. Any thoughts on this? I think there are a lot of reasons for these things. Some guys, like Billy Hamilton, is a natural right handed hitter. Over the years he’s turned into a better left handed hitter. That’s likely due to the fact that he’s able to just get a lot more reps as a lefty than a righty. With Ventura, it’s worth nothing that the sample size, particularly from the right side, is pretty small at this point in his career. And he’s still pretty young, so there’s time to keep working on stuff. But, I do wonder with some guys why they keep switch hitting when there’s a very obvious weakness from one side.